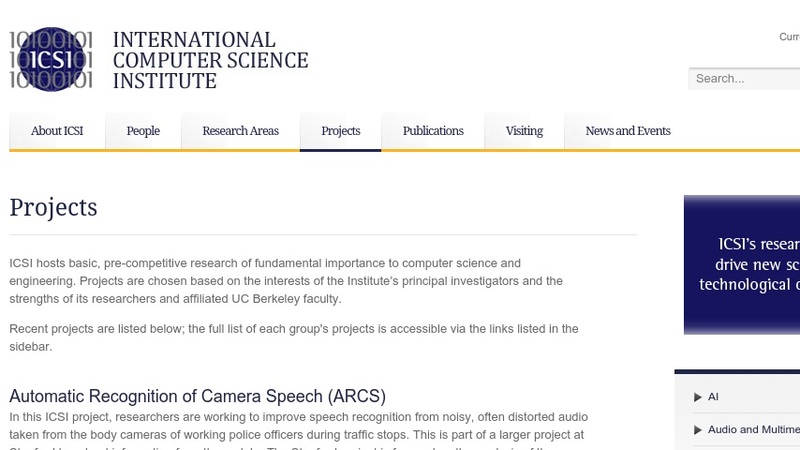 The International Computer Science Institute is an independent, nonprofit basic research institute that is affiliated with the University of California, Berkeley. The goal of the Institute is to create "synergy between world-leading researchers in computer science and engineering" by bringing together academic and industrial researchers. Its research currently focuses on Internet research, such as Internet architecture, open-source routing, and network security, as well as Human Language Technology, such as speech and text processing. A significant portion of the Institute's work is in theoretical computer science and projects are chosen for their importance and their compatibility with the strengths its researchers. This website provides links to websites detailing several programs including Algorithm Projects, AI Projects, Networking Projects, and Speech Projects. Other areas of research include a project "to support historically underrepresented ethnic minorities and women in their desire to become leaders in the fields of computer science, engineering and information technology;" the development of a Community of Practice Environment utilizing the Internet for information sharing and collaboration; and a project exploring Robust Video Compression based on Distributed Source Coding techniques. A number of publications, such as conference proceedings, academic journals, technical reports, and some books, are available to search and download free of charge. The _ISCI Gazette_, available in the News section, periodically features a research area. Research in Bioinformatics is discussed in the March 2005 issue.